Great Leap and the Japanese American Cultural and Community Center present FandangObon and the Mottainai EcoFest on Sunday, Oct. 26, from 11 a.m. to 3 p.m. at the JACCC Noguchi Plaza, 244 S. San Pedro St. in Little Tokyo. FandangObon 2013 shared participatory music and dance traditions of fandango from Vera Cruz, Mexico, which draws from African, Indian and Mexican roots, and Obon, a Japanese Buddhist tradition in remembrance of ancestors. 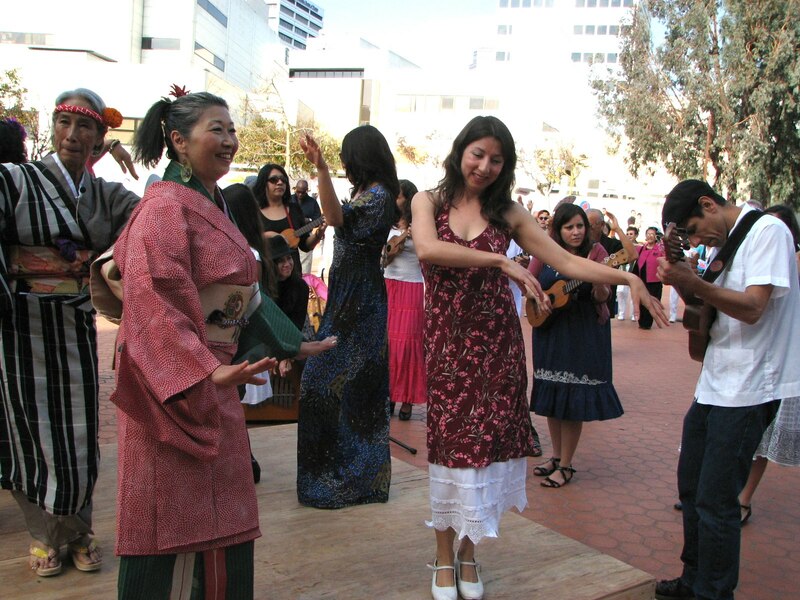 FandangObon came as an inspiration to composers Nobuko Miyamoto, Great Leap’s artistic director, who has created several new Obon songs and dances, and Quetzal Flores and Martha Gonzales of the Grammy Award-winning band Quetzal, who have helped to spread fandango in the U.S.
FandangObon 2014 expands the circle with egungun, an African Yoruban tradition using mask-making, music and dance to honor ancestors. Najite Agindotan, a Nigerian drum master, has joined the group and brings his African flair to the circle. With Sustainable Little Tokyo, the festivities will open with the Mottainai EcoFest, featuring workshops and exhibits to better environmental practices in communities of color. For more information, email [email protected] or [email protected] or visit www.greatleap.org.